After a few hours at Ebenezer’s Pub we headed out to North Conway so the wives could do some shopping while we drank beer. On the way we stopped at The Good Beer Store in Fryeburg because you can never have enough good beer. 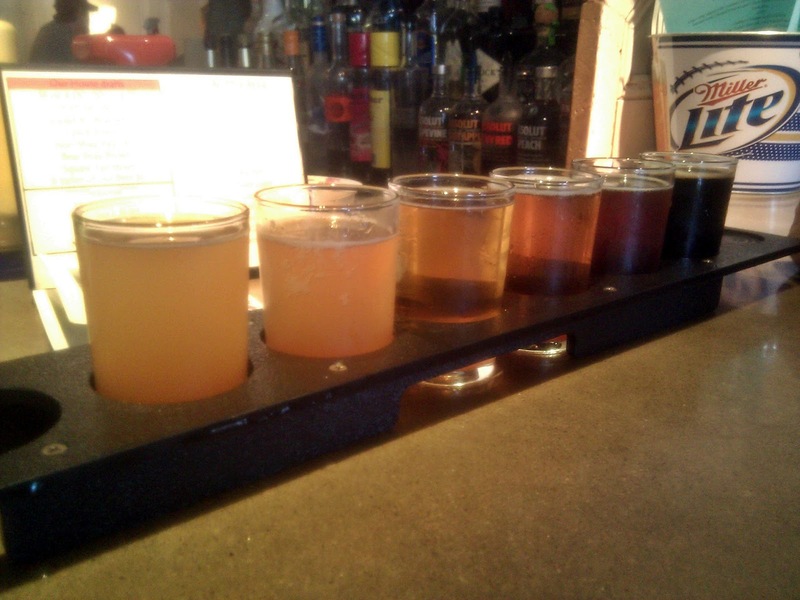 Moat has a nice brew pub located on the main drag in North Conway. When we arrived just before 5:00 on Monday the place had plenty of available seating and the bar staff was attentive. We started with the 6- sampler including their; Hoffman Weiss, Violet B’s Blueberry, Czech Pilsner, Iron Mike Pale Ale, Bear Peak Brown and the Square Tail Stout. 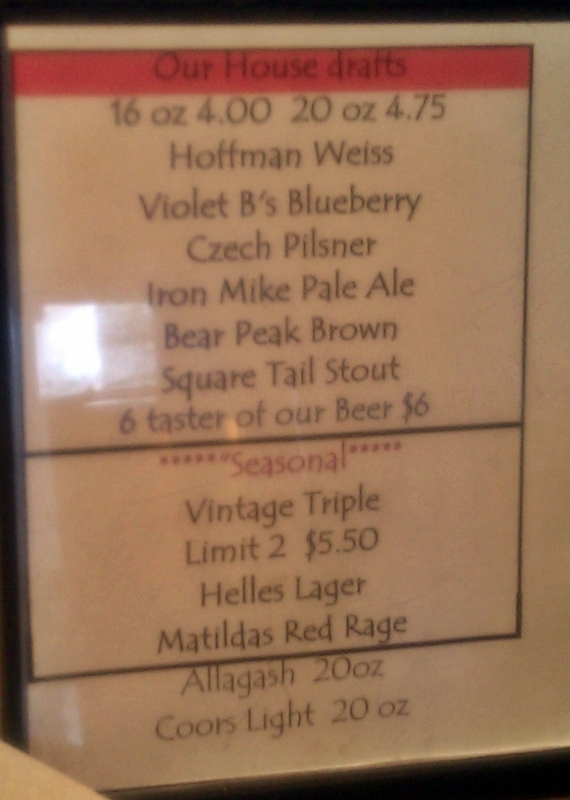 Of the 6 the only one that stood out was the Bear Peak Brown. The Weiss was light, cloudy and fruity – Violet B was better than many other Blueberry ales with only a very light fruit finish, not overpowering or terribly sweet. The Czech was a traditional pilsner and I do not like pilsners and the Iron Mike was a slightly hoppy pale ale but when you compare it to Maine Beer Company MO or the recently reviewed Edward from Hill Farmstead this does not even come close. Bear Peak Brown was a solid brown ale which according to the bar tender sells very well at the bar. Square Tail is a decent stout but the day we visited it was nearly 90 degrees and a stout just was not going to be a good choice. After the sampler I opted for a Matilda’s Red Rage while my brother in law had the Helles Lager. I sampled both and will do a separate review of the Red Rage but the Helles Lager was very simple and only slightly darker and more complex than the Pilsner. Overall a decent beer but not something to get too excited about. Ending the evening we shared a Vintage Triple which may have been the best beer we tried from Moat. Lots of spice, fruit and well balanced. Slight alcohol taste but that is to be expected from a triple with 8.9% ABV. Overall our visit to Moat was enjoyable and while the beer may have been fairly ordinary overall it was all quality stuff and worth trying if you are in the area.